It sounds like a broken record: contact lens hygiene. While it's not the most exciting topic to discuss, eye doctors see plenty of patients with significant contact lens complications, mostly related to bad contact lens hygiene. Though less common today due to better contact lens materials, 41 million Americans wear contact lenses and many are at risk of contact lens-related eye injury from lack of good contact lens practices. The Centers for Disease Control and Prevention (CDC) completed a study, the Contact Lens Risk Survey, that revealed 99 percent of people are not doing great at following the rules of wearing contact lenses. The study questioned 1000 individuals older than 18 years, 83 percent of the respondents were female, and 62 percent were over 40 years of age. Sleeping with lenses on: Sleeping in contact lenses carries around a 15 percent increased risk for getting an eye infection. Once thought to be due to a lack of oxygen to the cornea, researchers think there are many more factors that contribute to the increased risk. Napping carries the same type of risk, albeit lower because the time asleep is usually shorter. Topping off: Topping off disinfecting solution does not disinfect the lenses properly. After a multipurpose contact lens solution sits for more than a few hours, the disinfectant dissipates. Topping it off does not increase the concentration of the disinfecting agent enough to reduce the growth of bacteria and viruses. Failing to toss out the old solution further increases the risk by potentially introducing new pathogens to the solution. Replacement: Surprisingly, only 50 percent of the respondents reported extending their recommended replacement frequency of their contact lenses. Disposable lenses were created for a reason. Replacing your lenses on the recommended schedule is the single biggest recommendation you should follow. Changing your lens case is another important contact lens rule. Although you can’t see it, bacteria will grow over time. Replace contact lens cases every three months. Water sources: Swimming, showering, and rinsing contact lenses in tap water all carry the same risk factor: acanthamoeba. Acanthamoeba is an amoeba found in water, and for the most part, it does not pose a big threat to most of us. However, an acanthamoeba infection can result in a very red, painful, and light-sensitive eye. Acanthamoeba infection usually results in a large scar on the cornea, the clear dome-like structure on the front part of the eye, and can cause blindness. Treatment usually lasts six to 12 months, and oftentimes, the outcome is not favorable. 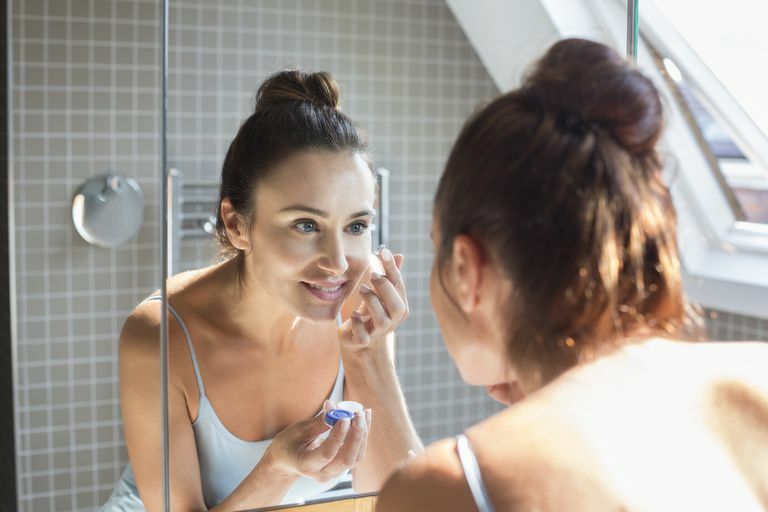 Although you can acquire an acanthamoeba infection without contact lenses, most people have a history of wearing contact lenses and some type of contamination with tap water, hot tubs, or stagnant river or lake water. Follow your doctor’s recommendations and take the care of your contact lenses seriously. A contact lens is an FDA-approved medical device, but it is still considered a foreign body in your eye, so proper care is essential for good eye health. See your eye doctor at least once a year for a comprehensive eye exam and contact lens evaluation. CDC. Contact Lens Wearer Demographics and Risk Behaviors for Contact Lens-Related Eye Infections — United States, 2014 Published in CDCWeekly August 21, 2015.